The Austin chapter dinner on was held Thursday, November 30. Two very special awards were given. The Scott Ozmun award for judicial courage was given to Judge Julie Kocurek, who was shot by a man that was set for sentencing by her. The second award was the Richard T. McCarroll award for civility and professionalism, which was given to Mary Dietz. New members received their membership plaques. 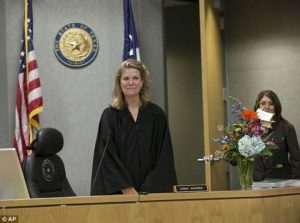 Kocurek is a George W. Bush appointee (1999) and became the first female district judge in Travis County. The won her first election in 2000 and then won reelection in 2004. On November 6, 2015, she was shot by a man who was to be sentenced in her court. She had 20+ surgeries and lost a finger. The was hospitalized for two months and thought about leaving the bench. She returned in February 2018 to a standing ovation from her colleagues. On April 26, 2088, the man who shot her, Chimine Onyeri, was found guilty of 17 counts, including assassination attempt. 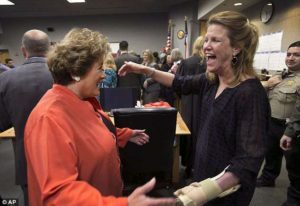 Here is a video about Judge Kocurek and her return to the bench after the shooting. D.A. Rosemanry Lehmberg welcomes Kocurek back to the bench. Back to work after 2 months in the hospital.